If you've ever dreamed of flying a wingsuit without the risk of jumping from a plane or mountain side, today is your lucky day. The self proclaimed 'Crazy Ones' from Stockholm, Sweden have just blown our minds with the worlds first inclined wind tunnel designed for indoor wingsuit flying. Peter Georén, Anton Westman, Johan Strömberg, and Jonas Tholin have formed Inclined Labs, the team behind Indoor Wingsuit Flying Stockholm. The inclined wind tunnel delivers an airflow that moves over an incline. The speed and incline can be adjusted thanks to the patent pending technology that Inclined Labs have created. New flyers use a harness safety system which prevents them from hitting the walls, ceiling or floor until they gain their balance. Professional flyers can fly freely without the harness. The required wind speed to fly is between 45-67 miles per hour (20-30 m/s) which is about the same as a strong storm. Compared to vertical wind tunnels that can reach speeds of nearly 200mph, these speeds are quite slow. The most intriguing part of these new wind tunnels is that flyers as young as 7 years old may take part in the fun. Since every new flyer is guided by a professional instructor and uses the safety harness system, the activity is available to almost anyone. Similar to traditional indoor skydiving, people with previous shoulder dislocations are advised not to fly. The amazing video shown in the promo was shot at a temporary test location. The first publicly accessible location will be available in September 2017 in Stockholm. 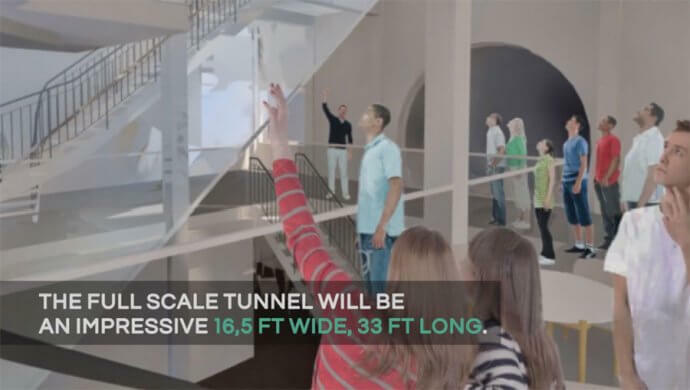 While the test tunnel feels a bit home-made, the public facility will feature a glass viewing area with a 16.5 ft wide, 33 foot long flight chamber. This should create some amazing possibilities in what is possible with a wingsuit. You can find more information about the facility on the Indoor Wingsuit Flying Stockholm profile page. The team behind Indoor Wingsuit Flying has already announced that they are a fully funded business. They are offering licensing of their patent pending technology for investors who are interested. Just like indoor skydiving did for traditional skydiving, we can't wait to see where this takes the world of wing suit flying! 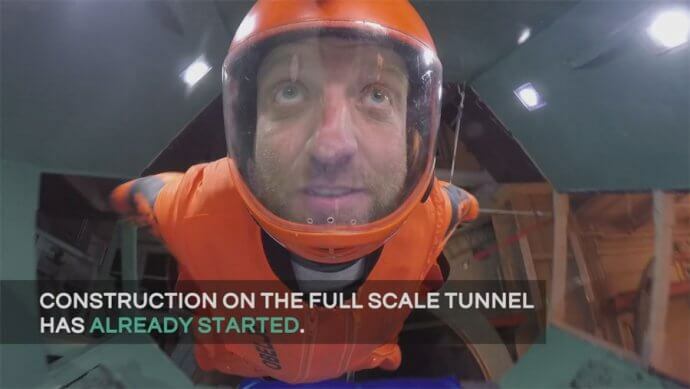 Hello Arik, see the link at the top of the article to the tunnel profile for Indoor Wingsuit Flying Stockholm.